Enhanced oil recovery (EOR) technologies are used to increase the amount of oil that can be extracted from an oil field after the primary and secondary production stages. The leading 20 players in the EOR market comprise a broad range of companies, including the six supermajors, large state-owned, or part state-owned, companies, and smaller private energy companies. Some of the leading players have diversified their EOR operations to include thermal, gas and chemical methods, often in numerous global locations, while others have focused their investments on one type of EOR technology or one specific region. Strong global EOR growth over the coming decade will be driven by a combination of factors, including recently rising oil prices, ageing oil fields, rapidly escalating global energy demand, technological developments, a desire to increase energy independence, increasing EOR opportunities in heavy oil and oil sands recovery, and a desire to reduce carbon dioxide (CO2) emissions. This will ensure that there are significant growth opportunities for the leading EOR companies, along with companies currently outside the top 20 list. 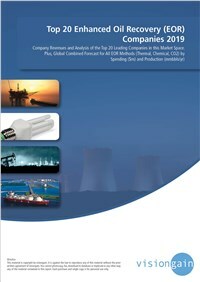 Who are the leading companies in the EOR industry? Do they have expansion plans, and if so where are they likely to go? What are the projects these top companies are currently involved in? hat is the total size of the EOR market in 2019? How much will it grow and why? What political, economic, environmental and technological factors affect the EOR market? This independent, 192-page report guarantees you will remain better informed than your competitors. With 115 tables and figures examining the companies within the EOR market space, the report gives you an immediate, one-stop breakdown of the leading EOR companies plus analysis and future outlooks, keeping your knowledge one step ahead of your rivals.